Mpho Maboi is well known to her fans as the sassy and vibrant radio presenter on YFM, having been with the station for over 6 years. She traded that profession in 2009 to join the world of sports on Supersport. 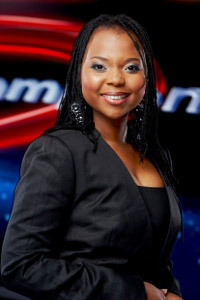 She hosted The NFD Show, making her the first female on Superport 4 to anchor a studio show on football. She then went on to do live matches and be part of the PSL News team, sharpening her sports journalism and script writing skills. Mpho was also the voice of the magazine show Love PSL. Always aspiring for growth and challenges, she has since joined SABC Sport, presenting a lifestyle magazine show alongside seasoned sports presenter LindaniMbense. Magazine as a writer. Being a mother and giver at heart, Mpho has taken to SANBS Ambassadorship where she encourages young people to donate blood regularly. She’s a former ambassador for Consol Glass, believing firmly in green living and the preservation of our planet.